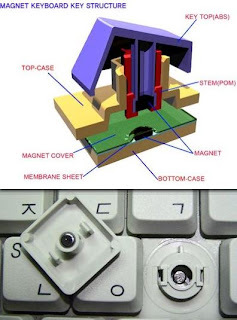 Fresh out of Korea today comes a newly invented keyboard that uses magnetic levitation instead of springs to absorb the pressure applied by finger stabbing the keyboard inwhich it appears enable smoother finger control flow in the process of typing. Embotec the company introducing this has a very impressive mouse over with sound effects and squeeze zoom graphics website but has not very creative naming for its interesting products. Nevertheless this keyboard must feel rather dreamy using it, since when depressing the keys will make for a soundless experience and probably provide users with a distinct finger sensation.